After the splendidly calm and helpful fine weather that accompanied our cruises down the East Coastfor more than a week, we had then become stuck at Ramsgate for more than a week and so we had taken some shore leave by hire car but the fine weather had returned for a day or two and so we returned and judged this passage dead right. For this trip around the sometimes tricky south east extremity of the UK, we experienced no more than 9 knots of breeze, mainly south-westerly, and smooth to slight seas with just a slight swell around Dungeness as a left-over from the seas of recent days. We cruised at an economic 10 knots, happy to take a full 8 hours and 30mins to cover the 82 nm and arrived in Brighton to a enjoy a calm night after a very enjoyable day at sea. 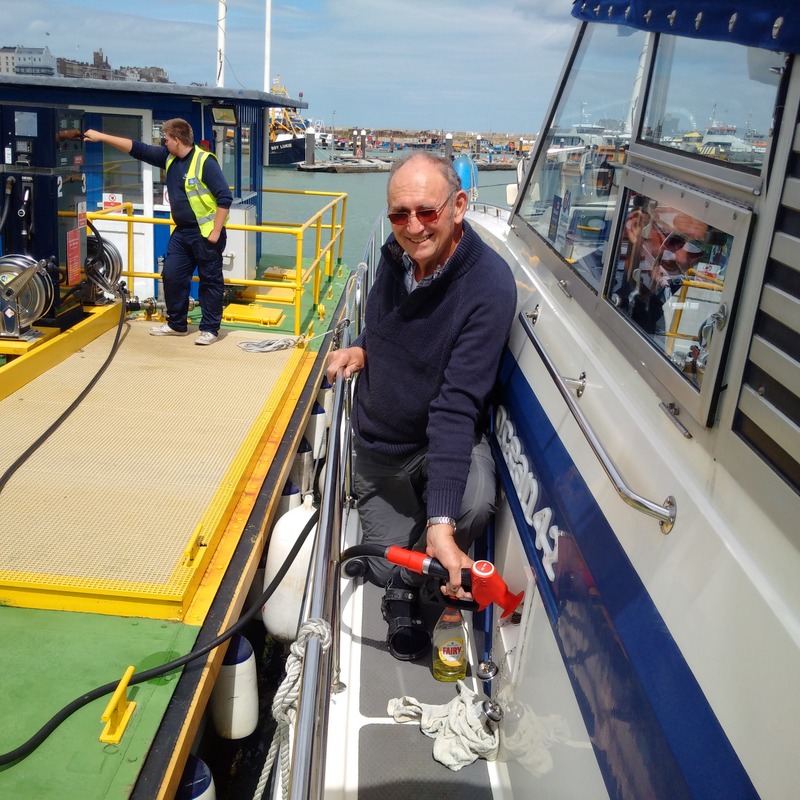 The day before leaving, we had moved Lady Martina from the inside harbour , exploiting the tidal window for the opening of the bridge barrier and topped up with just over 400 litres of diesel from the fuel berth. We therefore spent the night before our departure in the outer harbour which normally can be uncomfortable but, as evening approached, my expected anticyclonic weather arrived and we were very comfortable as later on as there was hardly any breeze or boat movement overnight. 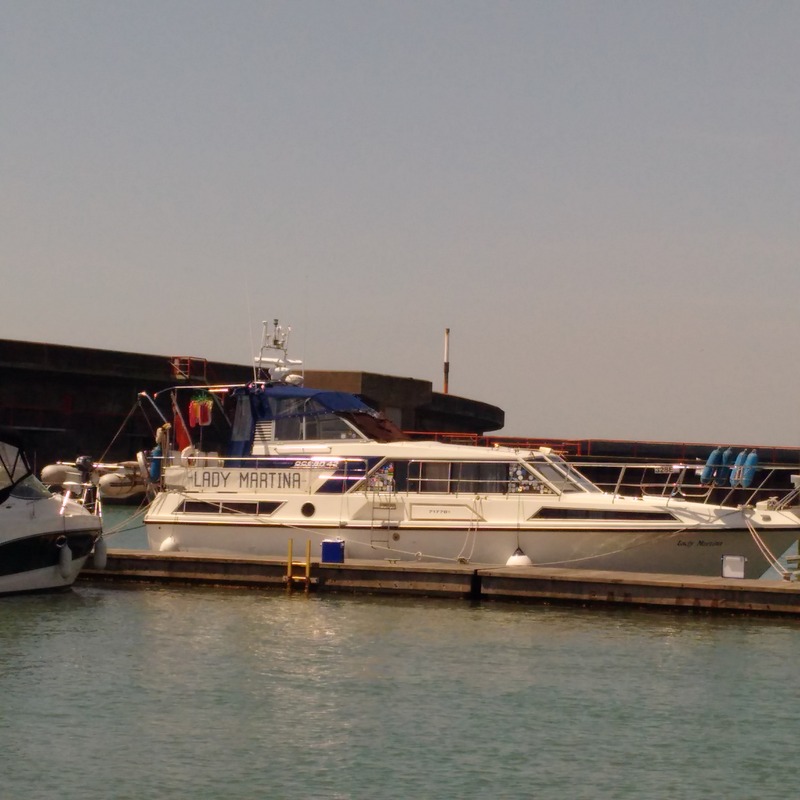 We encountered smooth seas as we headed out of port into the Ramsgate Channel around low water in the morning and then the tide was following at its strongest as we cruised south past North Foreland, taking care to check in with Dover Port control and avoid the many crossing ferries. 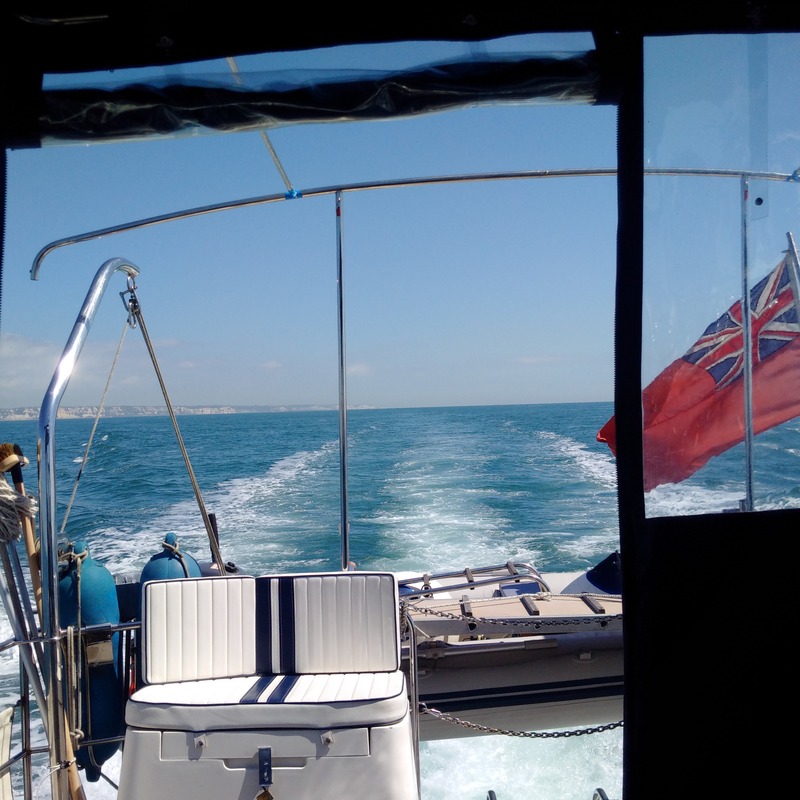 The tide turned against us as we cruised west but it is always weaker in the channel than off of Ramsgate and so I was pleased with the call; particularly as this meant that it was slack off of Beachy Head and calmer still as a result. Beautiful views of the white cliffs of Kent greeted us and it is only in your own boat that you get to see these at such short range, which could have been even closer if we had not wanted to press on. We were playing some of our favourite dance CD's and bopping to the boat's movement! The tide favoured us again as we ran along the coast to Brighton and the breeze remained at less than 9 knots all trip. Upon arrival, were give a berth right opposite the entrance in Brighton Marina but the night was dead calm and for a second night running, we had no noise or disturbance. We enjoyed a fine meal in Cafe Rouge nearby at the end of great day and would have liked to stay more than a single night in Brighton, but the weather for our next leg to Portsmouth looked better for the next day (rather than the day after that) and so much of the late evening was spent cruise planning, which was a shame!